Coupon Alert is a program that promises to help you purchase various goods at a lower price. This application might look like a useful tool, but you are strongly recommended against installing Coupon Alert on your computer. This adware application can collect data on your web browsing habits and then expose you to potentially unreliable websites. If you care about your system and data security, you will remove Coupon Alert at once. Adware programs may not be immediate computer security threats, but they can still lead to various security issues, so you cannot ignore that. We know where Coupon Alert comes from, so it makes it easier to foresee what this adware program is going to do. Our research specialists say that Coupon Alert is practically the same as Health Alert, Finance Alert, Storm Alert, and many other similar applications from the same group. They should alert you about some important and relevant news, but the problem is that you can never know whether the information and the websites you get redirected to are safe. Just like all the other applications from the same group, Coupon Alert can be downloaded from its main homepage. 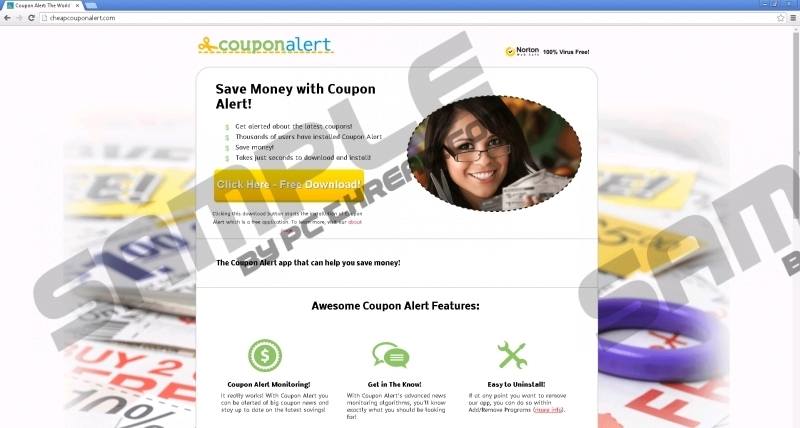 You can access the website via cheapcouponalert.com, but we definitely DO NOT recommend downloading this application. Even if you install Coupon Alert from the main homepage, if you fail to read all the installation steps, you could end up installing an additional search toolbar that would be installed on your browser. As a result, we can see that Coupon Alert is somewhat intrusive, and no user would ever want to deal with an intrusive application. Coupon Alert is entirely free to use, but may show advertisements while Coupon Alert is installed. These promotions help us keep Coupon Alert 100% awesome and free for you. The statement makes it sound as though Coupon Alert is doing you a favor, but in reality it simply causes you more trouble. This adware application is not liable for the security of third-party content, and all of the aforementioned ads are embedded with third-party content. Consequently, malevolent third parties can easily exploit Coupon Alert to promote and distribute their malicious links. If you did not intend to have Coupon Alert on your computer, remove it right now. If you installed this application willingly, you should also delete it at once. Open Control Panel and uninstall Coupon Alert right now. While you are at it, scan your PC with the SpyHunter free scanner to search for other potentially unwanted apps. You need to be sure that your computer is absolutely safe. Move your mouse cursor to the bottom right corner of the desktop. Select Uninstall a program and remove Coupon Alert. Click Uninstall a program and remove Coupon Alert. Select Add or remove programs and uninstall Coupon Alert. Quick & tested solution for Coupon Alert removal.